On August 31, 2017, Akshaya Patra, in partnership with Mitsubishi UFJ Financial Group (MUFG), expanded its presence to Narsingi, Telangana, with a high-tech kitchen. The kitchen has been set up with the help of The Bank of Tokyo-Mitsubishi UFJ, Ltd., a member of (MUFG). This kitchen will provide a nutritious school lunch every day, to over 35,000 children in Telangana. The launch was graced by Shri Bandaru Dattatreya, Honourable Minister of Labour & Employment as the Chief Guest. 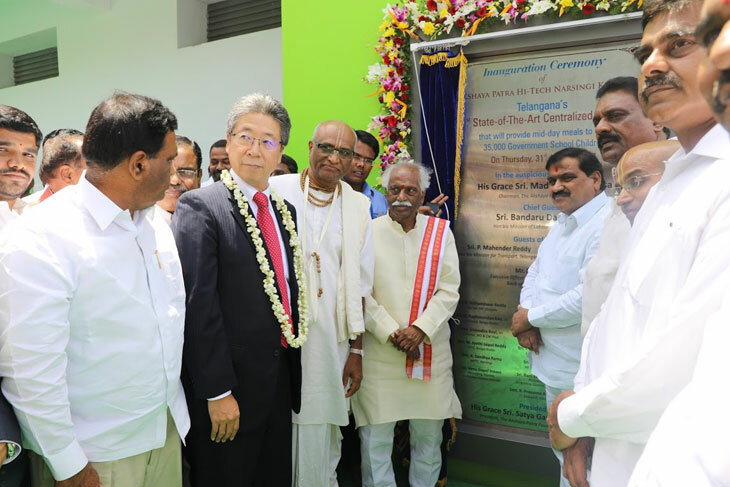 Shri P Mahender Reddy, Honourable Transport Minister, Telangana; Shri Tummala Nageshwar Rao, Honourable Minister for Roads & Buildings, Women and Child Development, Telangana and Mr Ryoichi Shinke, Executive Officer and Regional Executive for India, MUFG, attended the event as the Guests of Honour. The event was held in the presence of Shri Madhu Pandit Dasa, Chairman, The Akshaya Patra Foundation and was presided by Shri Satya Gaura Chandra Dasa, President, Akshaya Patra Telangana and Andhra Pradesh. The kitchen, in the current phase, is equipped to serve 366 anganwadi centres and in 238 schools through Akshaya Patra’s school lunch programme.